I have a post coming out in 21.5 hours time and rather have you all wondering why nothing came out today, here’s an image that will make sense when that post comes out. Thirty-five years ago this Christmas, a turbulent world looked to the heavens for a unique view of our home planet. 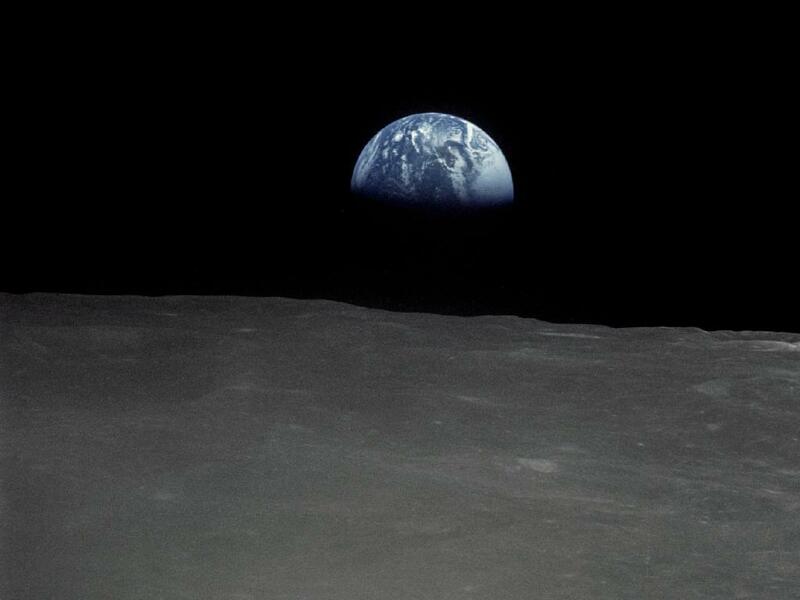 This photo of “Earthrise” over the lunar horizon was taken by the Apollo 8 crew in December 1968, showing Earth for the first time as it appears from deep space. 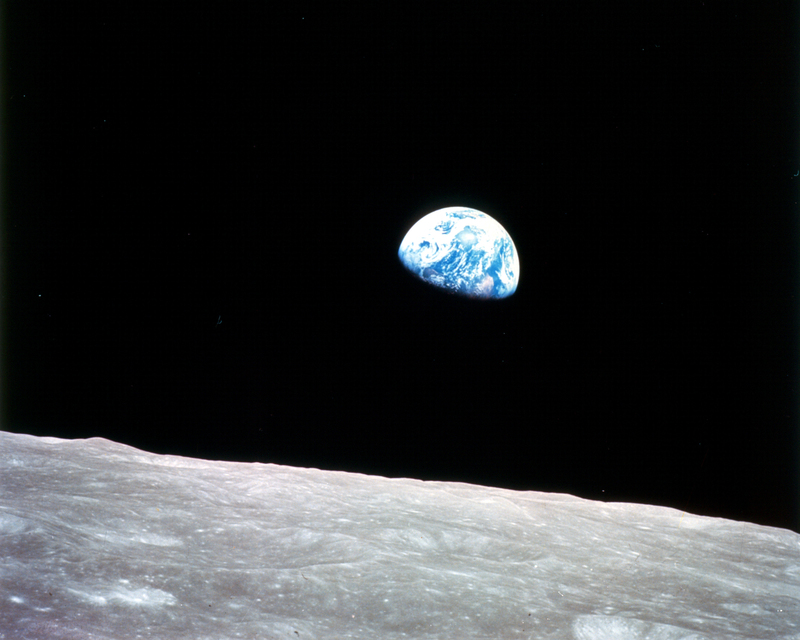 Regarded as one of the 100 photographs that changed the world, the late adventure photographer Galen Rowell called it “the most influential environmental photograph ever taken.” Captured on Christmas Eve, 1968, near the end of one of the most tumultuous years the U.S. had ever known, the Earthrise photograph inspired contemplation of our fragile existence and our place in the cosmos. 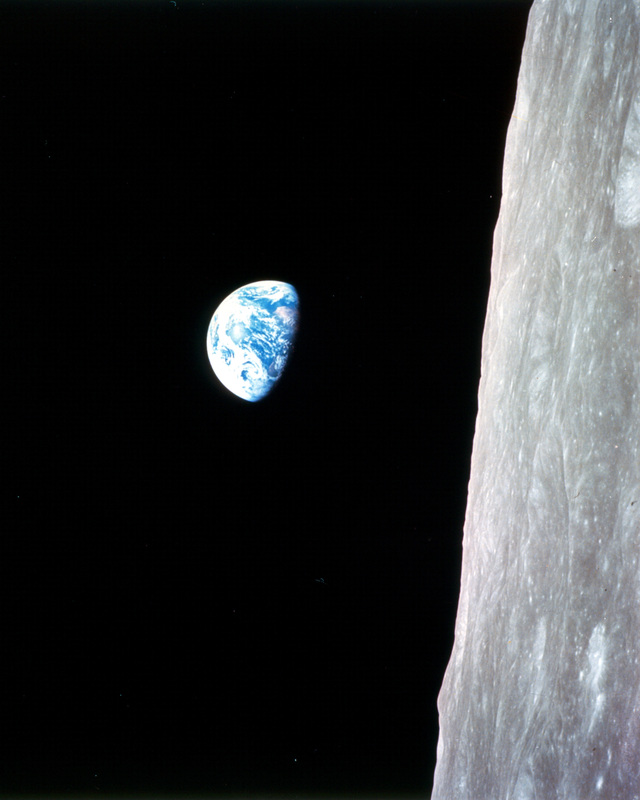 For years, Frank Borman and Bill Anders of the Apollo 8 mission each thought that he was the one who took the picture. An investigation of two rolls of film seemed to prove Borman had taken an earlier, black-and-white frame, and the iconic color photograph, which later graced a U.S. postage stamp and several book covers, was by Anders. Reference from here. The only one we have, Earth Day or not! It was called “the most influential environmental photograph ever taken.” Rightly so! Those words were spoken by the late Galen Rowell, the famous Californian wilderness photographer, commenting about the Earthrise photograph taken from Apollo 8 on December 24th, 1968 during the first manned mission to the Moon. No one who saw that picture of the planet we all live on could fail to be moved. Indeed, none more so than onboard NASA astronaut Frank Borman who uttered the words as the Earth rose above the horizon of the moon, “Oh my God! Look at that picture over there! Here’s the Earth coming up. Wow, is that pretty.” It was fellow Apollo 8 crew-member, Bill Anders, who then took the ‘unscheduled’ photograph. Who hasn’t gazed into a night sky and been lost in the beauty above our heads. Or felt the wind, flowing across our ancient lands, kiss our face. We stand so mite-like, so insignificant in all this immensity of creation. Our planet is ‘pretty’. Indeed, Planet Earth is good, beautiful, and so precious to life. Life that arose in just a fraction of time after our Solar System formed 3.7 billion years ago; the oldest traces of life have been found in fossils dating back 3.4 billion years. Our miracle of life. But the one thing we cannot do is to take that miracle of life for granted. Here’s a perspective on that. Just a couple of months after that famous Earthrise photograph, in February 1969, America’s National Oceanic and Atmospheric Administration (NOAA) recorded the level of CO2 in the Earth’s atmosphere as 324.42 parts per million (PPM). From 43 years ago we fast forward to February of 2012. NOAA now recorded that CO2 level as 393.65 PPM, some 21% higher than the 1969 level, but even more importantly over 12% higher than the figure of 350 PPM which is regarded by climate scientists as the maximum safe level for our Planet. And the trend upwards is steepening. Not just for CO2 but also for Methane and Nitrous Oxide which have the potential to be incredibly more damaging to our beautiful planet than CO2. Across the face of the world people are waking up to the fact that something has to be done. While some Governments and many industries are providing great leadership, the complexities of these modern institutions means that progress is slow; far too slow. People are now taking action for themselves and for their communities. The most notable group is the worldwide Transition Movement. It started in the UK in September 2006, indeed started in the town of Totnes, Devon, just three miles from where I used to live. Less than 6 years later across the world there are 975 initiatives! Including nearly 500 Transition Communities in Europe and 392 in the UK. That it is inevitable that our lives will soon have to adapt to a dramatically lower energy consumption, especially carbon-based energy, and that it’s better to plan for it than to be taken by surprise. That the over-whelming majority of communities, currently lacks resilience. That we have to act now to rebuild our community resilience and prepare for life without fossil fuels. That by tapping into the collective potential of the community, it is possible to develop new ways of living that are nourishing, fulfilling and ecologically sustainable. Reduce our energy use, increase our resilience, switch away from carbon-based fuels and go back to the strength of communities. No mystery about what to do! We do not have another 43 years. Indeed, some say we are very close to the tipping point of runaway climate consequences. My message for this Earth Day and, indeed, for every day of the rest of our lives. The National Preach-In held the week-end of February 11th/12th. Some while ago, I signed up for a week-end organised by the Arizona Interfaith Power & Light. It was part of a national programme inviting faith leaders from across the country to give sermons and reflections on climate change over the weekend of February 10-12, 2012. My interest was simply to learn more about the week-end. Then I quickly discovered that Father Dan from our church, St. Paul’s, had also signed up. In my innocence I offered to help in any way which was quickly met by a response that bowled me over, “Well, you can be the homilist and give the sermon!” Thus it came about that at yesterday’s 8am and 10am services yours truly rather uncertainly delivered the sermon. 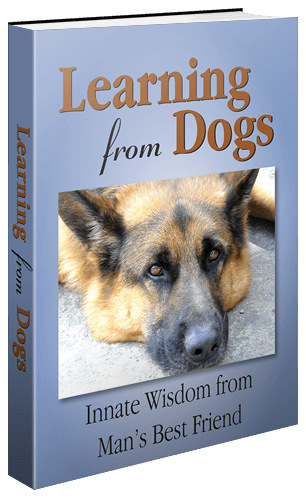 John H., who with my dear wife Jeannie, did so much to turn my rambling thoughts into a coherent theme, encouraged me to publish the sermon as today’s Post on Learning from Dogs. It now follows. We are talking about the photograph called ‘Earthrise’ taken from Apollo 8 on December 24th, 1968 during the first manned mission to the Moon. Each of you should have a copy of that picture close by. Look at it now and let your imagination be carried back to that Apollo 8 capsule and that momentous experience. As the Earth rose above the horizon of the moon, NASA astronaut Frank Borman uttered the words, “Oh my God! Look at that picture over there! Here’s the Earth coming up. Wow, is that pretty.” Bill Anders then took the ‘unscheduled’ photograph. Our planet is good, and so beautiful, and so precious to life. Life that arose in just a fraction of time after the Solar System formed 3.7 billion years ago; the oldest traces of life have been found in fossils dating back 3.4 billion years. That miracle of life. Who hasn’t gazed into a clear, Arizonan, night sky and been lost in the beauty above our heads. Or felt the wind, flowing across ancient lands, kiss our face. We stand so mite-like, so insignificant in all this immensity of creation; God’s creation. Our dreams, our hopes and failures, everything we are, have ever been and ever will be, nothing more than a swirl of dust across a desert track. Words from so long ago! But Jeremiah would, surely, have gasped with disbelief had he realised how, some 2,600 years later, ‘the land now mourns and the grasses so wither’. Jeremiah reveals much that we all could learn about ourselves. The other prophets couldn’t be accused of hiding behind their work but Jeremiah, out of all of them, allowed us to see the evidence of his own spiritual condition. He was a man of deep feelings and sensibilities and in his book there are five laments over the serious spiritual and moral condition of God’s people. That’s us, by the way! In that time of Jeremiah, the world population was 100 million persons; slightly less than the population of Mexico today. Some 1,350 years later, 1,000 A.D., the global population was 265 million. But by the year 2,000 A.D., our population had increased to 6,000 millions! Put another way, that’s an increase of 5.7 million people every year for a 1,000 years ! Any guesses on the increase in the last 12 years, since 2,000? Well, the global population has increased by 990 million. About 90 million every year! It is utterly unsustainable at present levels of Western consumption, let alone with poorer nations trying to ‘catch up’. Last September, our House of Bishops issued A Pastoral Teaching. Our Bishops believe those ancient words of Jeremiah describe these present times. They call us to repentance, to change. Let those words enter our souls: “If we cannot live in harmony with the earth, we will not live in harmony with one another.” Planet Earth mirrors our souls! Nothing new about that. In 1975, Berkeley physicist Fritjof Capra wrote in his book The Tao of Physics, “we can never speak of nature without, at the same time, speaking about ourselves”. Fr. Dan reflected in his January 22nd sermon on the questions, “Am I really free? Can I really change?” ….. and continued with the words from Jesus, “The time is fulfilled, the Kingdom of God has come near, Repent.” Fr. Dan reminded us that the word ‘repent’ indicates that we can change. We can change, we must, and we will. OK, from out of the mouths of North American Braves to out of the mouths of English babes. Let me stay in Britain. Martin Rees is a British cosmologist and astrophysicist and has been Britain’s Astronomer Royal since 1995. Sir Martin Rees, indeed Lord Rees as he is now, has been Master of Trinity College, Cambridge since 2004 and was President of the Royal Society between 2005 and 2010. Hang on to that word ‘midway’ as I continue reading from Rees’ presentation. “We depend on stars to make the atoms we’re made of. We depend on chemistry to determine our complex structure. We clearly have to be large, compared to atoms, to have layer upon layer of complex structure. We clearly have to be small, compared to stars and planets — otherwise we’d be crushed by gravity. Back to me! Just reflect on the magnificence of that fact! Science and poetry so beautifully woven together. We, as in humankind, the poetic manifestations of God’s unbelievable creation. Our relationship with the atoms perfectly balanced with our relationship with the sun. Brings a whole new meaning to seeing starlight in the eyes of the one you love! It is all so beautiful, so magical, so spiritual, so God-like. It is also so fragile and vulnerable. To advocate for a “fair, ambitious, and binding” climate treaty, and to work toward climate justice through reducing our own carbon footprint and advocating for those most negatively affected by climate change. I started with the taking of a photograph 43 years ago that forever changed our view of our planet. Now is the time to change our relationship with our planet, to love it and cherish it; it’s the only one we have. Otherwise, we may not have another 43 years left. Continuing from Part One last Friday. “While in every way that I can think of, I support the premise of mankind affecting global climate, I would love to hear from someone who could reconcile the Post above with these recent items:” and then included the links to the WSJ and Daily Mail items. If you are not familiar with those WSJ and Daily Mail items, then you will need to go back to Friday’s Post. And NASA never said anything about the Thames freezing over. Rose just made that bit up. 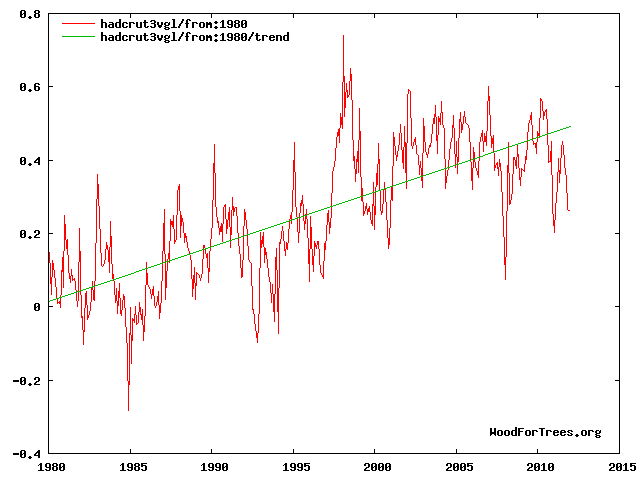 From this, it is pretty clear why Rose chooses 15 years as his starting point: 1997-1998 was the time of the largest El Nino ever recorded, resulting in a huge temperature spike. Using that as the starting point for a temperature comparison is absolutely classic cherry-picking. And in any event, you can’t say anything about trends in noisy data by simply comparing two arbitrary points. That is not a valid way to analyze the data (especially if you pick an obvious outlier as your starting point!). It is like trying to say whether the tide is coming in or going out by looking at the height of two waves. It just doesn’t work that way. You have to look at the long-term trend to remove the noise. Let me take you to that Met Office response (and I’m republishing it in full). For clarity I have included our full response to David Rose below:A spokesman for the Met Office said: “The ten year projection remains groundbreaking science. The complete period for the original projection is not over yet and these projections are regularly updated to take account of the most recent data. “The projections are probabilistic in nature, and no individual forecast should be taken in isolation. Instead, several decades of data will be needed to assess the robustness of the projections. It confirmed that although solar output is likely to reduce over the next 90 years this will not substantially delay expected increases in global temperatures caused by greenhouse gases. The study found that the expected decrease in solar activity would only most likely cause a reduction in global temperatures of 0.08 °C. 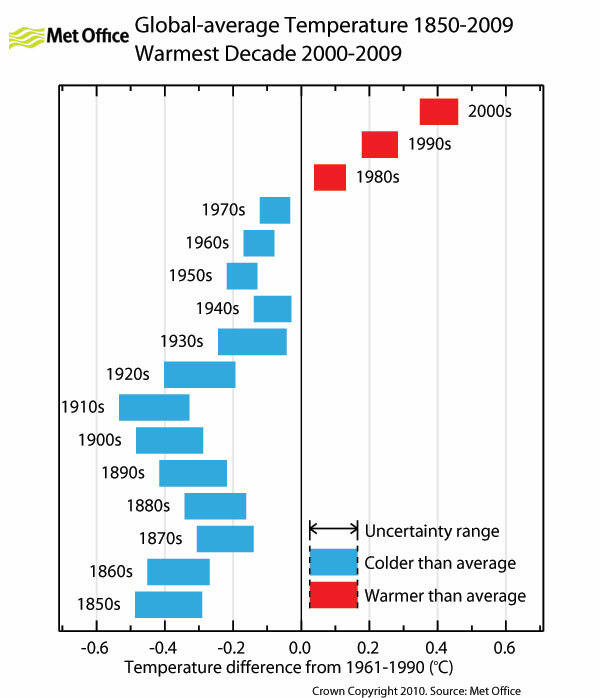 This compares to an expected warming of about 2.5 °C over the same period due to greenhouse gases (according to the IPCC’s B2 scenario for greenhouse gas emissions that does not involve efforts to mitigate emissions). In addition the study also showed that if solar output reduced below that seen in the Maunder Minimum – a period between 1645 and 1715 when solar activity was at its lowest observed level – the global temperature reduction would be 0.13C. Back to that response from chrisd3. 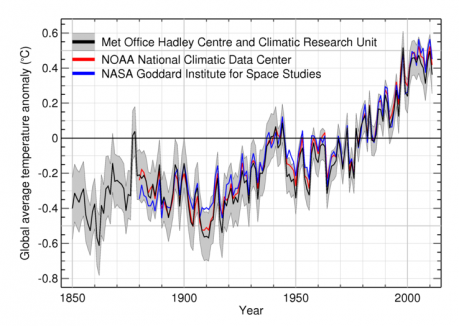 He offered this, “Finally, here is a chart of global temps from HadCRU.” Here is that chart, remember we are looking at Global temperatures. OK, between this Post and my Post last Friday, you probably get the message! There were many other contributions and I could go on and on quoting the great responses I got, all of them uniformly saying there IS global warming unprecedented in recent years. The message is crystal clear and those who wish to deny the evidence … well, I can’t come up with a polite term, so will just leave it at that! You may have seen my latest response to How much is most? When I eventually saw your earlier comment, I was surprised and disappointed in equal measure because I almost feel that I have failed in some way. Let me explain: Unlike ClimateSight and SkepticalScience, which both do an excellent job of focusing on the science of climate change, my blog is deliberately focused on the politics underlying the denial of all environmental our problems; including 2 key aspects to my MA dissertation, namely the political misuse of scepticism; and the psychology of denial. See my How to be a Climate Change ‘Sceptic’ for more detail. Therefore, although not specifically categorised as such, just about everything I have posted is traceable back to Paul and Anne Ehrlich’sBetrayal of Science and Reason (1996) and/or Naomi Oreskes and Erik Conway’s Merchants of Doubt (2010). For someone who does not currently go to any Church, I am remarkably fond of quoting Scripture so, if necessary, please forgive me but, as the Good Book says: “What has been will be again, what has been done will be done again; there is nothing new under the sun” (Ecclesiastes 1:9). Therefore, I do not think you should be surprised by the amount of misinformation and misrepresentation contained in the original WSJ Sixteen’s article; and/or the fact that denialist arguments are repeated no matter how many times they have been shown to be false. Furthermore, I would warn against trying to summarise it all on Learning from Dogs. This is definitely Book territory and, in addition to the two mentioned above, the market is already saturated by the likes of Climate Change Cover-up by James Hoggan and Climate Change Denial by Haydn Washington and John Cook. What to say to close these two Posts off? Frankly, it’s difficult to know how to pitch it. The science seems clear beyond reasonable doubt. But if you are reading this and disagree, then PLEASE offer the science to refute the conclusions presented here. I promise you that I will present it on Learning from Dogs. So let me end with a simple photograph. The now world-famous photograph was taken by Astronaut William Anders from Apollo 8, the first manned mission to the Moon, a little over 43 years ago on December 24th, 1968. Now project forward 43 years to the year 2055 and play with the idea of what ‘pretty‘ planet Earth will be like for mankind and so many other species, including our longest companion, the dog, if we don’t get our act together pretty soon! Yesterday, I published a soft little item showing some reflective pictures and rather appropriate words of attachment. Little did I know that some very powerful word forces were planning same day to really thump me around the head. Here’s what happened. The church that Jean and I go to on a regular basis is very inspiring. Two reasons come to mind. The first is the love and friendship that the congregation offer, both to regulars and visitors alike. The second is the spiritual inspiration gifted to the priest and, boy oh boy, does that come out through his sermons. Indeed, the rest of this article was motivated by yesterday’s sermon. It is difficult to care for people in the world when we are not a caring community. It is totally absurd to speak of peace in a world when we do not have peace in our community. It is impossible to be an instrument of love in the world if we are not a community of love. What is true in the Church is of course true in the world as a whole. We do need to learn to live together. Railway tickets used to carry the words, “Not good if detached.” That is true of life in general. Our survival and progress as people on this planet are dependent on our interrelatedness. See the beautiful spiritual inspiration that comes from those gifted to draw such powerful word pictures. Take that last word ‘interrelatedness’. Jean and I are studying at the local college for a Master Gardener’s Certificate. For the simple reason that we have to find a way to tame our wild garden, comprised mainly of decomposed granite granules, so that we can grown our own vegetables, have some chickens, that sort of thing. The last session was about botany. To a complete non-gardener like me it was, nonetheless, fascinating. What moved me beyond measure was the detail and complexity of all things botanical; grasses, trees, shrubs, flowering plants, you name it. It was the interconnectedness of it all. Here’s an example. Not a female wasp, just an orchid. Few can resist the allure of a beautiful rose, but some wasps outdo even the most ardent flower lover. Presented with the right specimen, a male orchid dupe wasp ejaculates right on the petals. Many insects mistake flowers for femmes, but few go as far as these wasps, says Anne Gaskett, a biologist at Macquarie University in Sydney, Australia, who led a study of the insects’ amorous intentions toward two species of Australian tongue orchids. “It’s just so hard [for the wasps] to resist,” she says. 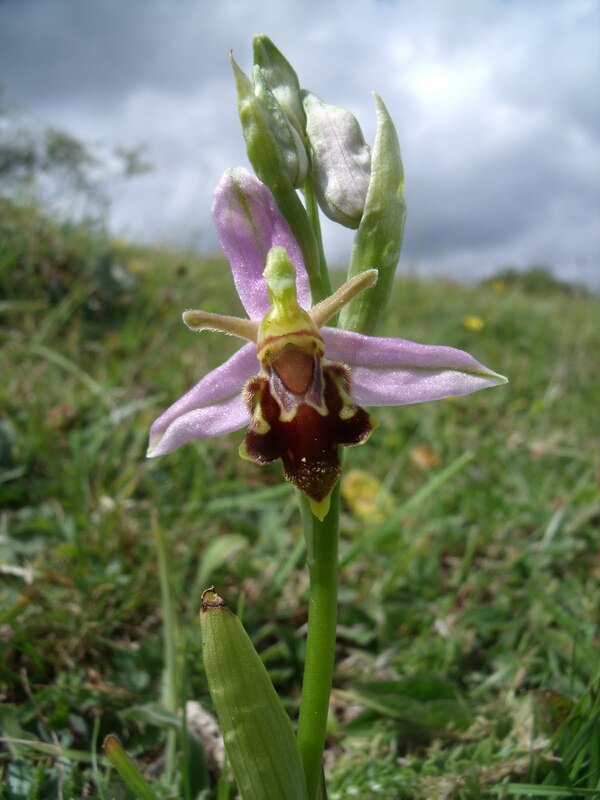 Orchids are known for toying with males. Many species produce female-mimicking perfumes that lure males into spreading pollen. But most insects merely touch down on the flowers. But why might an orchid provoke such misdirected affection? Gaskett thinks that her experiments show an extreme form of sexual deception that helps the flowers spread their own seed. Think about that the next time you order flowers! OK, let me get back to that botany class. As our teacher pointed out, lose that particular species of wasp and the planet probably loses that species of orchid. Think about the interconnectedness of that, and much more in the beautiful planet all around us. It is such a marvellous, beautiful, complex and interconnected world. We need constant reminding of that fact. Which is where yesterday’s sermon hit the mark again. That is a wonderful image, riders on the earth together. It speaks of our togetherness as a human race, brothers and sisters on this fragile island within the vastness of the universe. Brothers and sisters … that really need to know … that we are brothers and sisters. Not good if detached. Amen. What a powerful sermon. What inspired power in those words. Real words. Forgive me for holding your attention just a tad longer. This is the full Archibald MacLeish’s quotation, referred to in the sermon above. When you’re finally up at the moon looking back on earth, all those differences and nationalistic traits are pretty well going to blend, and you’re going to get a concept that maybe this really is one world and why the hell can’t we learn to live together like decent people. I think the one overwhelming emotion that we had was when we saw the earth rising in the distance over the lunar landscape . . . . It makes us realize that we all do exist on one small globe. For from 230,000 miles away it really is a small planet. The power in those words. The power of the truth about our interconnectedness and the power of Not good if detached. Let me leave you with a fragment from another Blogsite that I came across quite by chance while researching for this piece. A blog is a voice, the inner voice, telling, in this case, what is going on, inside and out. And in me, that means it should also be about my spiritual path. My spiritual life is as important to me as breathing. Without connection with the One, what is life? What is it for? Yesterday’s post It’s all we have showing the famous Earthrise picture taken from Apollo 8 generated a lovely follow-up. It’s all we have and it’s so insignificant! Can you see our planet home? 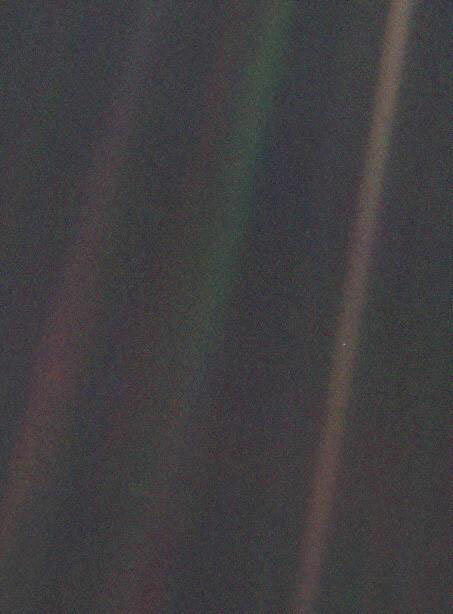 Earth appears as a tiny dot (the blueish-white speck approximately halfway down the brown band to the right) within the darkness of deep space. In a 2001 article by Space.com, STScI‘s Ray Villard and JPL‘s Jurrie Van der Woude selected this photograph as one of the top ten space science images of all time. Carl Sagan later wrote about his deep feelings about this photograph. That was almost 20 years ago and, as I reflected just a few days ago, human insanity still seems alive and well; it’s about time that the majority of us recognised the fragility and vulnerability of where we live. Sagan’s words are reproduced here and should be read by every inhabitant of this planet. From this distant vantage point, the Earth might not seem of particular interest. But for us, it’s different. Look again at that dot. That’s here, that’s home, that’s us. On it everyone you love, everyone you know, everyone you ever heard of, every human being who ever was, lived out their lives. The aggregate of our joy and suffering, thousands of confident religions, ideologies, and economic doctrines, every hunter and forager, every hero and coward, every creator and destroyer of civilization, every king and peasant, every young couple in love, every mother and father, hopeful child, inventor and explorer, every teacher of morals, every corrupt politician, every “superstar,” every “supreme leader,” every saint and sinner in the history of our species lived there – on a mote of dust suspended in a sunbeam.The Earth is a very small stage in a vast cosmic arena. Think of the rivers of blood spilled by all those generals and emperors so that, in glory and triumph, they could become the momentary masters of a fraction of a dot. Think of the endless cruelties visited by the inhabitants of one corner of this pixel on the scarcely distinguishable inhabitants of some other corner, how frequent their misunderstandings, how eager they are to kill one another, how fervent their hatreds. You may also wish to watch this video. Thanks Mike for prompting this piece. A bit tight on time for today’s Post so just feast your eyes on this image. This view of the rising Earth greeted the Apollo 8 astronauts as they came from behind the Moon after the lunar orbit insertion burn. The photo is displayed here in its original orientation, though it is more commonly viewed with the lunar surface at the bottom of the photo. Earth is about five degrees left of the horizon in the photo. The unnamed surface features on the left are near the eastern limb of the Moon as viewed from Earth. The lunar horizon is approximately 780 kilometers from the spacecraft. Height of the photographed area at the lunar horizon is about 175 kilometers. The Apollo 8 mission was the first time man had left the orbit of the Earth.